When your favorite crime fiction publisher asks you to do the cover reveal for one of your favorite crime series, the answer is a very easy YES. 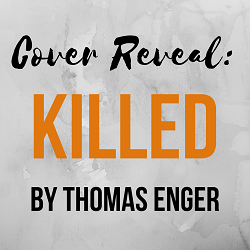 I’m absolutely thrilled to share the cover reveal for KILLED by Thomas Enger, the final installment in one of my personal favorite Nordic Noir series! KILLED releases from Orenda Books on February 15, 2018; American readers, KILLED will be available in the States in Fall 2018 - and if I may say so myself, I think this book has my favorite cover of the entire series! KILLED is the final installment in Enger's Henning Juul series—a series which has become a personal favorite for me. The Henning Juul series is a brilliant blend of Nordic Noir’s gritty, melancholy atmosphere with fast-paced, engaging investigations. I’ve read this entire series now (scroll to the bottom of this post for links to my reviews), and I can honestly say it just gets better and better as it goes—I was hooked from Book 1 (BURNED), but have become all the more invested in Enger’s heartfelt and gripping series as I’ve continued to read it. Tying this series together, and giving it an emotional depth and sensitivity that differentiates it from so many of its crime fiction peers, is main character Henning Juul. A damaged, troubled journalist, Juul's life was shattered when his apartment caught fire one night, and his young son was killed in the blaze. The emotional and physical scars Juul bears have come to define him, and he has dedicated himself to searching for justice for his young son. Juul is one of the most sympathetic characters I’ve read in a long time—it’s impossible to read these books without becoming fully invested in his tireless quest to avenge his son’s death, and heal from the trauma he has endured. Enger’s books will totally capture your attention: from their layered plots to their endearing characters, these books are a fantastic choice whether you’re looking to try Nordic Noir for the first time, or are a seasoned reader of the genre. I'm totally honored to share the cover reveal for the final Henning Juul series installment, KILLED, with you today! Many thanks to Orenda Books for facilitating this cover reveal. Read on for more information about KILLED, and to see the book's stunning cover! international sensation before publication. Burned is the first in a series of 5 books about the journalist Henning Juul, which delves into the depths of Oslo’s underbelly, skewering the corridors of dirty politics and nailing the fast-moving world of 24-hour news. Rights to the series have been sold to 26 countries to date. In 2013 Enger published his first book for young adults, a dark fantasy thriller called The Evil Legacy, for which he won the U-prize (best book Young Adult). Enger also composes music, and he lives in Oslo. Who started the fire that killed Henning’s young son? How is his sister, Trine, involved? Most importantly, who can be trusted? Packed with tension and unexpected twists, Killed is the long-awaited finale of the internationally renowned series featuring conflicted, disillusioned but always dogged crime reporter Henning Juul, and one of the most chilling, dark and moving crime thrillers you may ever read. Pre-order your copy of KILLED here! Want More Info on Thomas Enger’s Books? You’ll find a ton of content on CBTB, including reviews of each Henning Juul book, an author interview, and more! Below are my reviews of the Henning Juul books, linked in series order. Book 4: CURSED // Read My Review | Read My "Interview with Henning Juul"